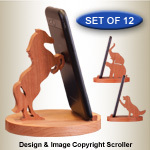 Our clever character cell phone stands not only give great visibility, but they look good too. You may just want one for every room of your home! These useful little holders will also be welcome gifts and just may be the perfect stocking stuffer when the holidays roll around. They also will sell well at craft shows and art fairs. They're easy to make from 1/2" thick hardwood of your choice and our full-size patterns. Finish the hardwood by sealing with clear coat or staining and then sealing. Your holders can also be painted to match or contrast with your phone. Complete instructions are included.